One of the most basic ways we love our children is through prayer. But if we’re honest, prayer is one of the hardest things to do consistently and intentionally. Below we want to share two stories about prayer from the life of our family, and then give a few tips for capturing and leveraging everyday moments to pray with your toddler. This post, which I wrote along with my wife, Megan, originally appeared at The Gospel Coalition. Jared and I (Megan) typically drive to church in separate cars on Sunday morning. He heads in early to help set up and to pray with the other pastors. Then I bring—or drag—the girls in for the early service. One Sunday, I was running late. We were late getting up. We had to wait for a train to pass. And I was worried I wouldn’t find a place to park before the service started. Then, just as I pulled up to the building, another car pulled out of its space. Immediately, I blurted out: “That was lucky!” And as soon as I said it, I felt a twinge of conviction. I’d started out that Sunday without even thinking about God and the way he guides my days. Rose Marie Miller’s conviction about God’s intimate involvement with our lives made an impression on me. One lie we believe that keeps us from prayer is that God and the real world aren’t connected. I tend to think that the everyday stuff I do as a mom—cleaning house, getting kids ready for school, finding parking spots—don’t matter to God. But the Bible combats the artificial distinction I make between the sacred and the mundane. Paul tells us to pray without ceasing (1 Thessalonians 5:17). I think the only way to truly do that is to pray about normal life. The songwriter who gave us Psalm 104 confirms my suspicions. He sees God at work in everything—from the upper chambers of the heavens to the normal meals we eat every day. One of the hardest things for me (Jared) as a dad is when our girls won’t stay in bed at night. Selfishly, I just want my kids to go away after 9 p.m. I work hard each day, and I tend to think this is something I deserve. But God knows better. There was a season of parenting when I was considerably angry at whoever decided to run commercials for It during college football games! Goodness, the fears are real. And of course, we stop everything in those moments. We pray. We cuddle. And we tuck her back in. Sometimes multiple times in a night. Over time, I’m coming to see those moments less as a frustration and more as an opportunity to learn something about prayer. Jesus encourages us to ask for anything in his name (John 14:13–14). Like children, we have permission to run into our heavenly Father’s chamber. And when we meet him, we can expect that he will be eager to see us and give what is best (Matthew 7:7–12). God cares about everything, so we can talk with him about it all. Matt Chandler regularly talks about how parents can capture and leverage moments in the course of everyday life for the purpose of gospel-centered conversations. Specifically, how can we capture and leverage everyday moments to help our kids—even our youngest kids—learn to pray? 1. When you’re happy, give thanks and adore God. Our family says thank you to God before we eat. Megan uses this time to help us thank God for blessings we’ve received recently. Then, at the end of the day, our kids will say thank you to God for everyone in their lives—mom, dad, grandparents, pets, and so on. Saying thanks to God was concrete and simple for our toddlers. For whatever reason, it was less natural for them to practice adoration, that is, to say thank you to God for who he is. One way we’ve tried to cultivate this is by asking our kids what they learned in our nightly Bible story, and then encouraging them to thank God for that immediately after. 2. When you’ve sinned, tell God you’re sorry and ask for his help to repent. When I (Jared) got in trouble as a kid, my mom made me confess my sins to my dad after he got home from work. It was a way to teach me about my need to confess my sin to my heavenly Father as well. I love the simple connection that practice made between moments of correction and prayer. We can have a similar practice when we sin against our kids as well. The next time you lose your temper with your toddler, take time to stop, confess what you’ve done wrong, and ask your son or daughter to pray for you. 3. When you need help, ask God to intervene. One of the best ways to practice continual prayer is to identify the moments when emotions—both yours and your kids’—are the most intense, then stop wherever you are and take that emotion to God. Whether it’s fear about scary clowns or anxiety over parking spots, God cares about it all. God, thank you for our daughter, and for watching over her today. Help her to grow up to love and trust Jesus. Please help her to have godly friends and a godly husband when she grows up. Please watch over her tonight and protect her from Satan and his schemes. Amen. The “godly husband” part wasn’t really a part of Luther’s prayer, but Megan’s dad added it when she was growing up, so we kept up the tradition. In those intentional times of daily prayer, you can also ask your child if there’s anything you can pray for them about. Even if there’s nothing on most nights, keep asking. You’re modeling for them from an early age that God and you both care about their entire life. The Lord cares about everything, so we can talk with him about it all. Teaching our kids about prayer begins with that simple conviction. Colin Smith as a post about fighting sin. He starts his post out this way, “As you come to know God better, you will become more aware of your sin.” He goes on to list 3 ways to fight against our sin. This is a great reminder for all believers. Justin Buzzard currently has a series of posts on discipling your kids. In this post he’s asking the question of motives. What is your motive to disciple your kids? He says, “Desire is the one motive that powers biblical, healthy, sustainable discipleship.” Parents, this is a great series so far and very worthy of your attention. My friend, Scott Kedersha had a post on the importance of prayer. 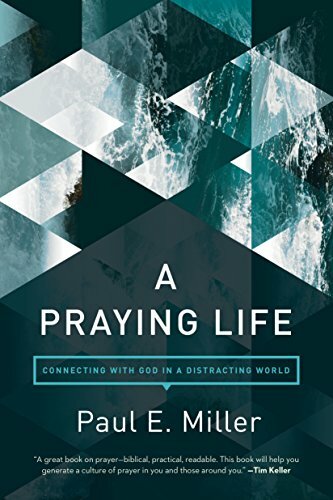 He says, “Most of us desire to pray, but for many reasons (as shared in part one of this series), we choose to NOT make prayer a priority in our lives and relationships.” If you are like me and struggle with prayer, this series is for us. What have you found online that we need to check out? Leave a link in the comment section. Raising kids can be a bit like sailing through a storm. You are so focused on the wind and waves you lose track of where the boat is headed. Most of my time and energy focuses on refereeing fights, making breakfast, and getting them to and from school, sports, and their other activities. It's easy to be distracted from what we're aiming for. It was meaningful to me when I was dating my wife when her dad mentioned to me how he'd been praying for me for years. Someone was praying for me who didn't even know me. So since the time my own children were babies, one question I've had in the back of my mind is what kind of person will they marry? I've been praying for my future son and daughters-in-law too. And I've tried to be proactive about talking to my children about what characteristics they should look for in a future spouse. You say I'll never get your blessing 'til the day I die. "Tough luck, my friend, but the answer is 'No'"
Don't you know I'm human too? This particular song annoys me every time I hear it. I hate saying it. We should expect a non-Christian group to represent the world's values. "Rude" is a fun song. At the same time, the message is an influence of which I want my kids to be aware so they can guard their hearts. "Knowing you and mom, the most important thing is that he loves Jesus," Josie replied. "Then, he needs to like the Cardinals.” she added with a giggle. "I do want you and mom to like him. I do want to know what you think of him," Josie added. Well, maybe you know why I'm here. Your daughter and I have been dating for some time now, and you've always been real, real nice to me. I look at your family pictures and I realise that I want the same thing too. I almost feel like I could call you mummy and daddy. Really that's what I'm here to talk about. I'm a real good man. “How is the person in this song different from the one in 'Rude'?" I asked. I pray for wisdom in leading my kids to be attracted to a person who treasures Christ. I pray the Lord would grant them wisdom as well. I pray for my child's future spouse. I pray they would be raised to love Jesus. I pray that love would be evident in their life. Finally, I pray for my attitude and anxiety. How about you? Are you engaging your children about who are they going to marry? Are you modeling for your children the type of spouse they should seek? Are you talking to your kids about the type of spouse they should be? Logan Gentry had a post on the Verge site on discipleship. He writes, "Discipleship is really messy and more of a slower process than we want or realize." This is true for every discipleship relationship: parent to child, pastor to congregant, friend to friend, etc. The good news is this mess is a mess well worth making. Christina Fox had a post on the True Woman blog on the discipline of children in prayer. She wrote, "Children learn from us how to pray by watching and listening to us pray." She then goes on to list ways to help our kids. Parents, this is helpful for you as well as your kids. Pastors, this needs to be encouraged. Mark Merrill had a post on the importance of education for our kids. He says, "Head knowledge is important, but heart knowledge is even more important and required to lead a productive, meaningful, and significant life." This is primarily the responsibility of parents. What have you been reading online lately? Leave us a link in the comment section and we'll check it out.